I've kept a cherry theme going all summer. You might say I am still cherry-ized! A little change I made includes this colander with cherries the I found on a visit when we saw the kids a while back. I also got the metal tray at the same place. I added the woven mats for texture. 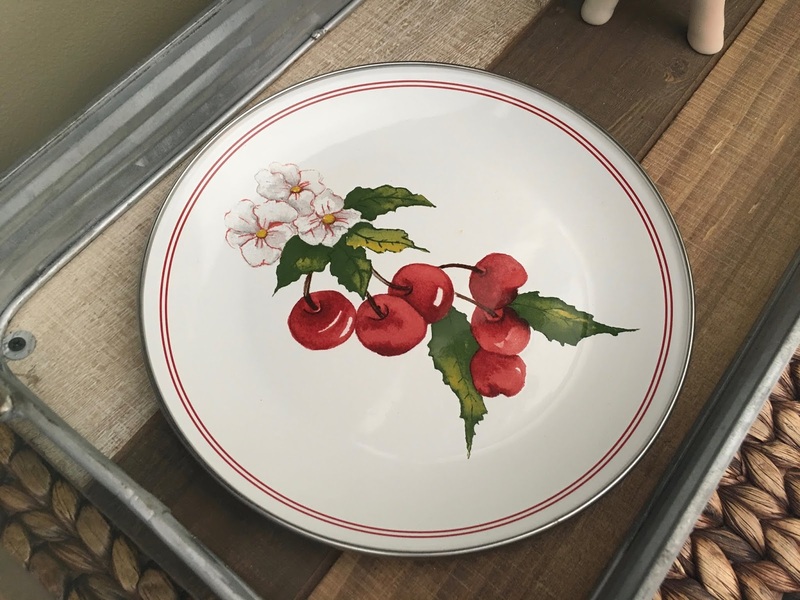 Love the pretty blossoms and cherry design. I hated to put it in storage so I set it out on the new tray. The colander came with this plate to catch water but it will also make a nice display piece by itself! There are other designs including blackberries, strawberries and more. They come in a beautiful gift box so they would make a great gift for someone. 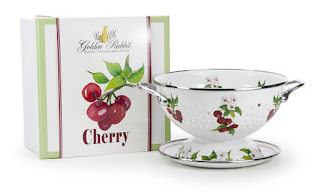 It's by "Golden Rabbit" and you can buy from them directly or search enamelware with their name and it pops right up on many websites. I've had these placemats for several years and decided to leave them out on the table for a while. I fell in love with the red and white checked border mixed with the cherries. I kept the cherry dishes on display on the plate rack. I pulled the blue flowers out of the red bucket floral arrangement just to tone down the red white and blue a bit. I stuffed my big rooster on the bottom shelf and added some green plants for color. I don't have a lot of collections but I have grown a pitcher collection. I mostly use them for display and floral designs. 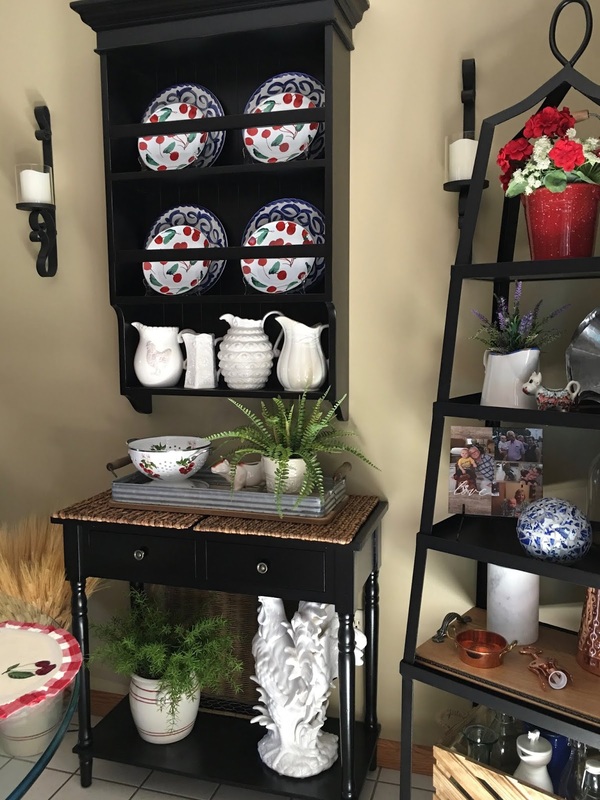 The creamy white and red pottery vases came from Pottery Barn a little while ago. They marked them down and I got free shipping so I was delighted. 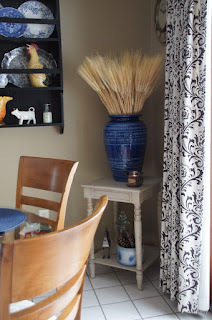 I brought out my big armful of dried wheat that I had used in my big blue pottery piece several years ago. I've had it wrapped in paper for a while! I fully intended to place these vases on top of the black table but the sizing was all wrong. My bad! 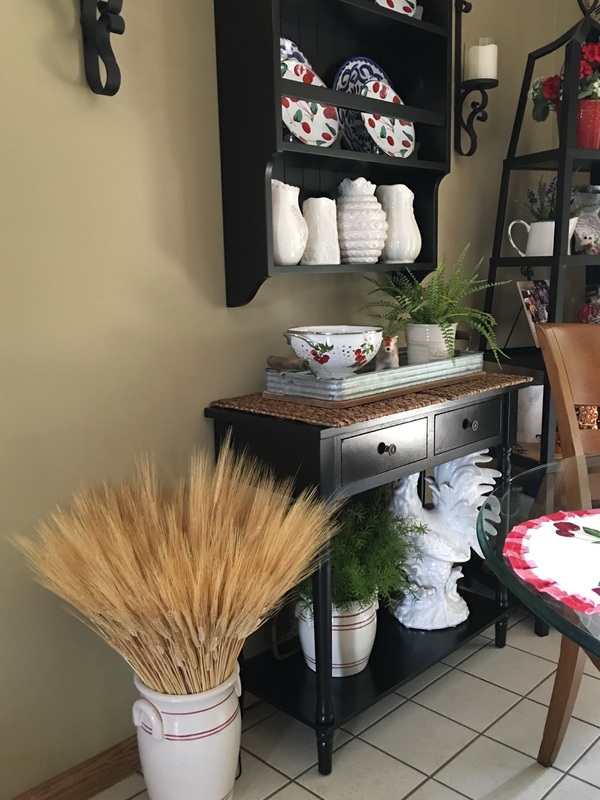 I'm not sure if this all qualifies as "farmhouse style" or if it's "country style" but I like it! Still Cherry-ized but I'm about ready for a change! Since we're at the halfway mark of summer I'm ready to start a new look! I am a big fan of anything cherry to eat or use in decor. Your plates are so adorable. Happy Sunday. OH! 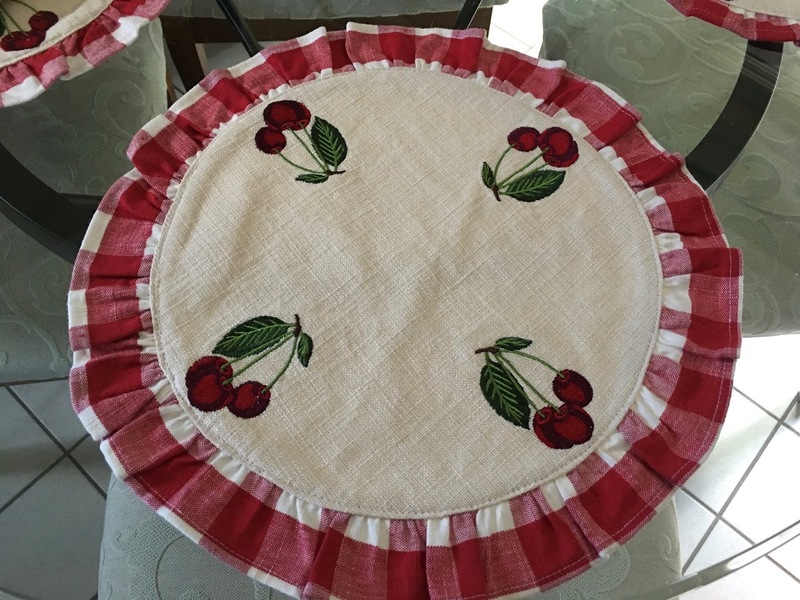 I love the cherry motif~~ Do you know that we are at the base of the cherry capital of the Midwest (Door County). We ship cherries all over the world from here--something about the soil and weather makes the cherries spectacular. Your collander is the best, Liz. And with cherry fest and all, I can see why you keep the theme going all summer. Boy -- the cherries have been delicious this year. I think I went through six pounds on my own. (The cherry diet!). Can't wait to get back to the lake and relax. 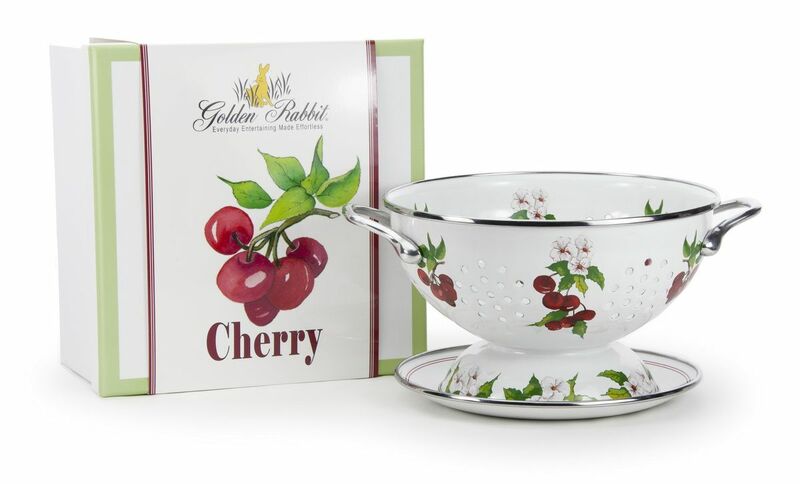 I need another colander like I need a hole in the head, but that one with the matching drip dish...tempting! Kitchen drudgery catches a bit of a break when working with pretty pieces that are also utilitarian. The design you chose is, of course, perfect for your region! I know you’re itching to switch things up, but this look is rockin’!!! Liz, that colander is so pretty and the plate that goes with it. I have been eating so many cherries this summer and enjoying them. I may just need to order that colander. I don’t have anything with cherries on it. Have a great week! Love the look - and the placemats! How neat! What a darling colander. The cherries are so cute! 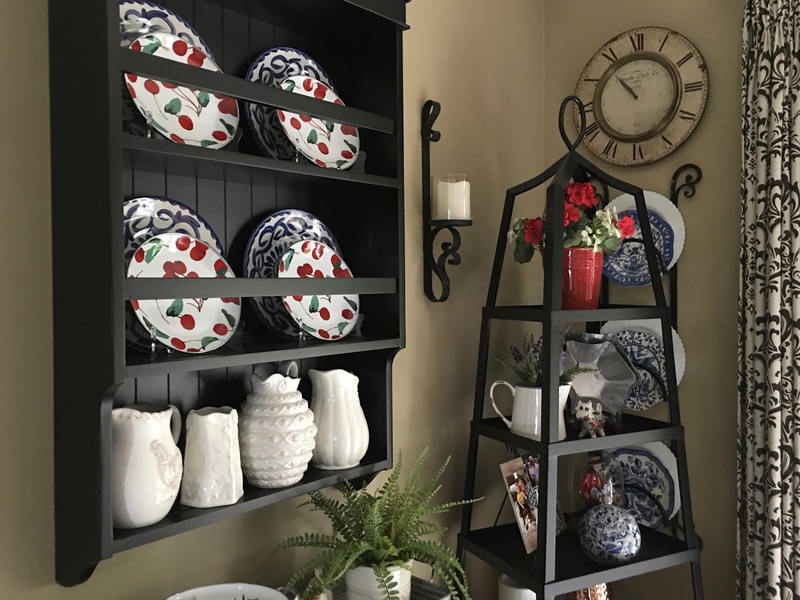 The plate rack looks lovely. Always fun to change it out! How special the placemats are. It's so cheerful and fun and the cherries are delicious.